As said, Kuurne-Brussels-Kuurne usually suits the fast men, yet last year the race was won after a solo. Jasper Stuyven escaped with 17 kilometres remaining and he was too strong to be reeled in by a first chasing. Kristiff sprinted to second place, while Bouhanni finished in third. The route is a perfect copy of last year. Basically, the only difference is the Onkerzeleberg. Altough it was featured in the 2016-edition, this time the organisation decided it is a climb. No Stelvio though with 2.1 kilometres at 3%. According to tradition the race starts at Kuurne’s hippodrome. The route travels to the first climb of the day, Edelareberg, crested with almost 30 kilometres done. Following a flat intermezzo of around 80 kilometres the other eleven climbs are included within a 80 kilometres frame (check underneath slideshow for distances and gradients). 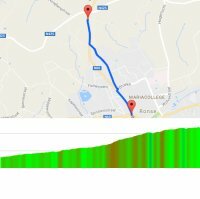 The last 50 kilometres of Kuurne-Brussels-Kuurne are pan flat. The race is set to conclude with two local rounds of 15.3 kilometres. Two years ago Mark Cavendish outsprinted Kristoff and Viviani on the line, while homerider Jasper Stuyven is – as said – title holder after an impressive solo in last year’s final lap.